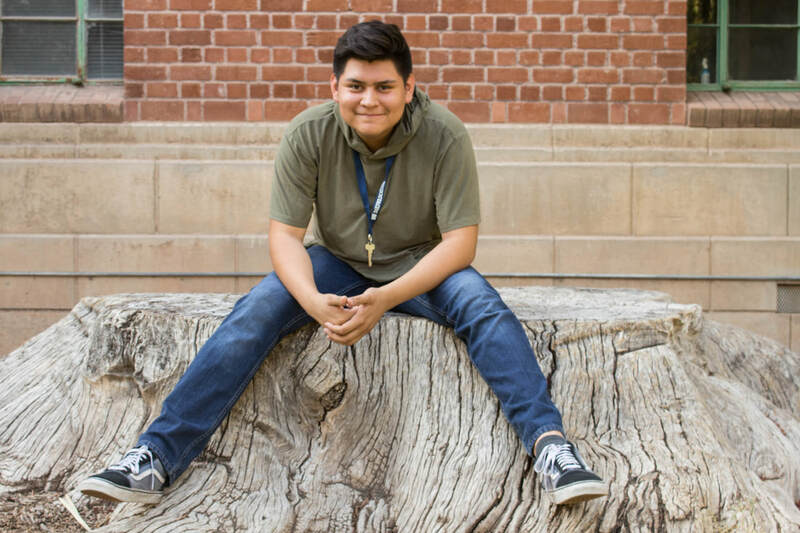 Despite constantly switching between high schools, Julian Francisco Armenta has graduated from Cholla High School in May. Underneath his reserved exterior, there lies an innovative, kind-hearted fashionista who is chasing his dreams. Before graduating at 18 years old, Julian was able to gain enough experience from his high school’s drama club to get an idea of his future profession. His dream as a younger child was to become neurologist and save lives, but once he saw videos of what the profession consisted of, he retreated back to square one. Not long afterwards, his younger brother, Eduardo, suggested Julian explore journalism. His response was like any other newcomer, “What is that?” After learning what it was, Julian realised he had a passion for videography, where he can be talkative, mindful, saucy and brutally honest with quick-witted humour, he said. “Work smarter, not harder” Julian said, mentioning his plans to pursue screenwriting at Pima Community College. Julian enjoys fashion as a hobby. He keeps up with the latest trends and regularly creates his own designer clothes, sometimes even sewing some for his younger sister. Working with fabrics intrigues him as a way to stand out from others. Fashion is a way to portray who a person is, Julian said. Julian credits everything he is to his mother, Rosa. Rosa is a Mexican woman who was not able to complete high school, but she is to be a diligent, savvy and an intelligent person. After giving birth to Julian when she was 17, she gave up her high school career to provide a life for her son. She worked numerous jobs, day and night, to support Julian, hoping to give him a better life with many more opportunities then she had, because her son’s joy was her happiness. Although Julian acknowledges his mother’s significant role in his life, he recalls his father being his mother’s rock during difficult times. Julian’s father, Juan, was an only child with little family support and attention. His father formed himself to be the complete opposite of his own parents. He also dropped out of school to raise his new baby with Rosa. Julian praised how his parents sacrificed for their children. “My father is what completes my mother, and to me, it is the main foundation of what makes my family great,” he said. Julian is continuing work on his television show, Family High, which he began while in high school. The show discusses high school situations for teens. The show has improved his videography and script writing skills, to where it can guide him to perform successfully in college. He said the show will bring him success and is only the start of his career. As an assistant photographer and reporter of The Chronicle, Julian is a dedicated, innovative worker who can achieve whatever he puts his mind to. Sadie Azersky values personal growth and the passion of chasing one’s dreams. She believes that today’s society is stuck in a mindset of negativity, especially in young adults. She goes through moments of negativity herself due to her social anxiety and when she does, she communicates with close friends for comfort and tranquility. Therapy was one way she used to deal with her anxiety; however, now she goes with a different approach: natural healing with oils. Ever since, she hasn’t spoken to a therapist. Sometimes, medication can lead to addiction, depression, or other health issues. Sadie believes that more times than we think, the side effects of medications can be worse than the purpose. Her advice for those who want to practice natural healing is to experiment and research the types of oils, because each scent varies for individual people. Personally, she uses peppermint to help with nausea, and exercises and drinks lots of water because she trusts that a healthy body supports a well mind. Don’t be discouraged to give up if the first few experimental scents don’t work like expected, everyone is different, she adds; medication shouldn’t be the first resort for all cases of distress and mental/physical illnesses. When asked to describe herself in three words, Sadie laughs and says, “Ambitious, open-minded, and impatient.” Sadie believes she’s ambitious because she’s hardworking and likes to take on challenges. As a result, she attends harder classes. Open-minded because she’s accepting to others’ ideas. She eventually goes on to explain that she was not as open-minded as she considers herself now because she was stubborn and used to hold her views and opinions before others; however, now she cooperates better with others and thinks from multiple perspectives. Impatient because her mind wants to get things done as soon as possible. A prior teacher of hers, Mr. Girard, helped her become the person she is today by opening her eyes to ideas and encouraging her to be more accurate and attentive in her interest of journalism. Sadie sees herself being successful in the music industry, more specifically playing piano. She listens to classical music because she says it’s very defining and she makes a personal connection with it, she explains. When she’s playing the piano, her mind becomes serene and at peace. Playing piano helps her express her emotions. At a very young age, her parents described her as expressive. She recalls a time when she listened to a song about a storm and her first reaction was to explain what a storm sounded like on a piano. Sadie discovered contemporary music, and fell in love. She hopes to inspire others and prove that hard work does pay off. Besides contemporary music, she has also dipped her toes into the world of theatre. When asked her ideal role she choose Millie from Thoroughly Modern Millie without much hesitation. Ivory Bacy, a writer who strives to try new things, displays passion about expanding her horizons and enjoys meeting new people. “I’m always honest with myself and other people. 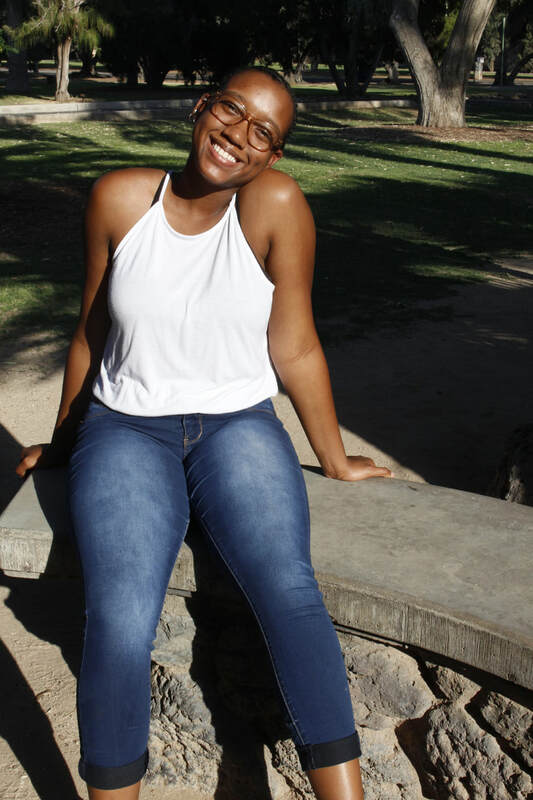 I want to live life with the least regret possible, so I do what I want in the moment,” said Ivory, who is a 17-year-old senior at Sahuaro High School in Tucson. Ivory is devoted to her ideas of how to live life in the best way possible. She said she is most dedicated to writing. Ivory’s favorite form of writing is in drama. She has written scripts for short films and plays; her dream is one day to be involved in a professional theatrical production. One of her completed plays is a dramatic mystery about a group of kids mourning the death of their friend at a police station, as everyone attempts to figure out what happened. However, each of the kids has a different account of the story that is untrue. Her fascination with journalism sprouted from her interest in writing, and her love of film sparked an interest in broadcasting. This intrigue is what propelled her to take part in the Journalism Diversity Workshop. “It kind of has to do with the film thing because [of] broadcasting and having a face in society, and informing people about things they definitely should know,” Ivory said. Her feelings toward Tucson aren’t negative. She appreciates the city’s Mexican food, eegees and the rich cultural variety. “I like how it’s more diverse than some other cities in Arizona – or in America,” she said. Ivory enjoys listening to alternative R&B music, writing, painting and hanging out with friends. She calls herself a “nerd” because of her interest in learning new languages, such as Spanish and American Sign Language. Ivory also describes herself as goofy, curious, creative, tolerant and hungry. She loves food, her favorite food is salad, specifically Southern salad with bacon, ham and cheese. She would like to be remembered as someone who is “in-depth,” a person who has many interests, can do several things well, and is knowledgeable about a variety of topics. Kaleb Reyes Clyde, a 16-year-old girl from Winslow High School in Northern Arizona, grew up in a tiny community of about 40 people yet her world view is vast. As a member of the Navajo Nation, Kaleb grew up in a small community called Teesto on the Navajo Indian Reservation. Her family home is about 40 miles north of Winslow, where she has attended school since she was a little girl. At Winslow High School, Kaleb will be a senior in the fall. She plays varsity softball, is a member of the science club, is a member of math club and in the National Honors society at her school. She has been involved in multiple clubs at her school and sees the world from different angles but she has one talent she loves to share: Art. Kaleb sketches, uses charcoal and pastels and sprays graffiti. Kaleb’s father, a graffiti artist, usually comes home with board canvases to practice graffiti while Kaleb observes. Kaleb did not particularly like going to school half of the time, but now that she’s near graduation she says she will always have memories in her heart about the good days in school. Softball season will be a special memory for Kaleb, working all day every day and the way the team bonded over accomplishments and work ethics. When Kaleb started school, her art work amused her educators and peers; they never knew someone at such a young age could be so talented. ​She has been taking art classes since elementary school, she plants to take art history at Northland Pioneer College, a nearby community college in Show Low, Arizona in the fall. Kaleb recalls leaving the house for elementary school most days at 4:30 a.m., so her mother could be at work by 7 a.m. at Winslow Indian Health Care Center. With Kaleb’s sports and other extracurricular activities, they often wouldn’t return home until close to 10:30 p.m.
Kaleb's parents differ greatly, from upbringing to tastes and personalities. Her father took care of himself, going from home to home since he was a young, and he developed his own way of surviving the streets. Her mother grew up in a strict household, limiting her to not making her own life choices and resulting in missing out on multiple opportunities, Kaleb said. "I would say that I have a very diverse way of thinking because my mom taught me how to be speak up for myself, to be responsible, humble and kind, while my dad taught me how to fight for myself, survive, be aware of my surroundings and to have common sense." Her father’s side of the family is artistic, Kaleb’s uncles make art pieces and jewelry and her father is a graffiti artist as a side hobby to his carpentry job. On her mother’s side, her relatives are engaged in the medical, engineering and education fields. Kaleb said she gained many of her professional interests from her mother’s side of the family which includes leadership, preservence and intellectual skills. "Art is all around us in many different perspectives," Kaleb said. Kaleb enjoys drinking tea that is “not too bland and not too sweet.” It gives Kaleb a sense of mental comfort and euphoria, whenever she is in a stressful situation. She also likes to relax and listens music, especially K-pop. Her favorite group is 방탄소년단, also known as BTS. In about ten years Kaleb hopes to pursue her dream of travelling around the world, discovering and experiencing what life has to offer. 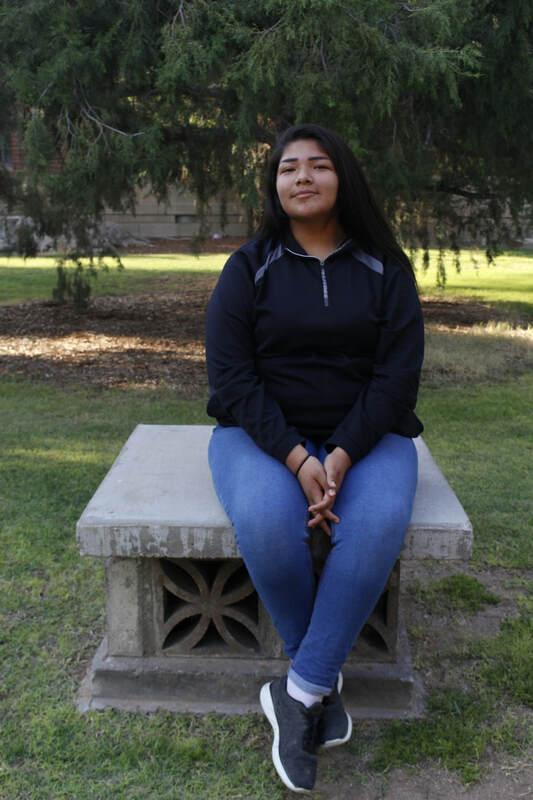 Dara Garcia is a 16 year-old athlete, future scientist and is currently working as a journalist for The Chronicle, a newspaper produced by high school students at the University of Arizona. 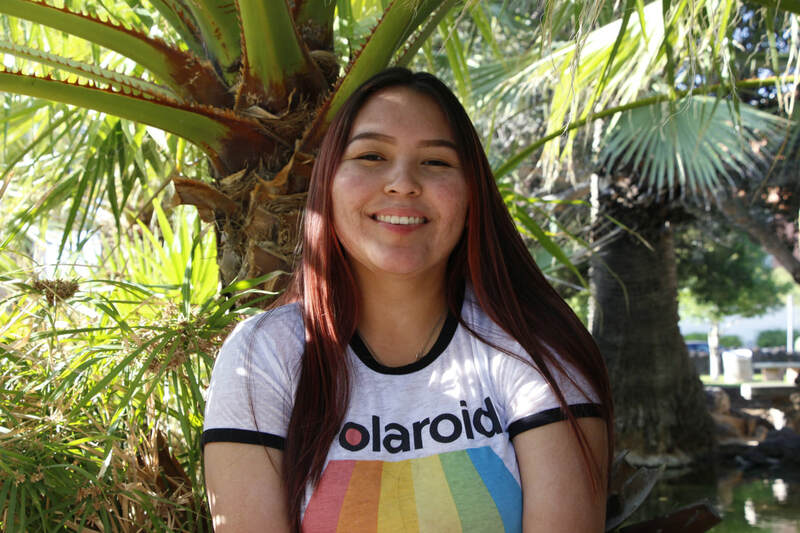 ​Dara plays volleyball and softball, but her favorite sport is Toka, a traditional hockey-like game played in the Tohono O’odham nation. The game starts with seven players on a flat dirt. The players utilize sticks called “usaga’’ and a puck known as “ola’’ to play the game of toka. These tools are handmade from mesquite and cannot be found in stores. Dara has been devoted to these games for the past nine years. Dara also shows a passion for science, specifically biology. She enjoys spending time in the laboratory and wants to have a science-oriented job in the future. During the last week of July 2018, Dara will be attending the Air Force Aviation Summer Camp in Alabama. Her teacher, Mr. Beres, inspired her to be a part of the camp and created a GoFundMe campaign to raise the $2,100 needed to attend at camp. At the age of five, Dara moved to Hikiwan, Arizona with her grandparents and six siblings. As she and her siblings grew older their relationship just like in common families involved many silly fights. Dara enjoys the company and bond she shares from her younger sister, Erica. She relies on Erica when there is a problem regarding school or simply when she wants to express how she feels. “There are times we have a lot of fights because we have similar characters and both tend to be mean to each other,” she said. Dara’s family was built listening to Nico Band and the Red Hot Chili Peppers and as she grew older her taste in music expanded. She enjoys listening to music from the 80’s, rap and reggae. Dara and her seven siblings have been fostered by their parental grandparents since the loss of both their parents. Despite their grandmother, Delma, being in charge of Dara, Romeo, Dereck, Carleen, Erica and Cassandra, their oldest sister Cassandra was the one who raised them and took care of them. Dara has had problems with a couple of school counselors, and was sent home from boarding school for what they said was “for her own good” according to Dara’s anecdote. She was unable to finish her sophomore year not aware if she will be held back. 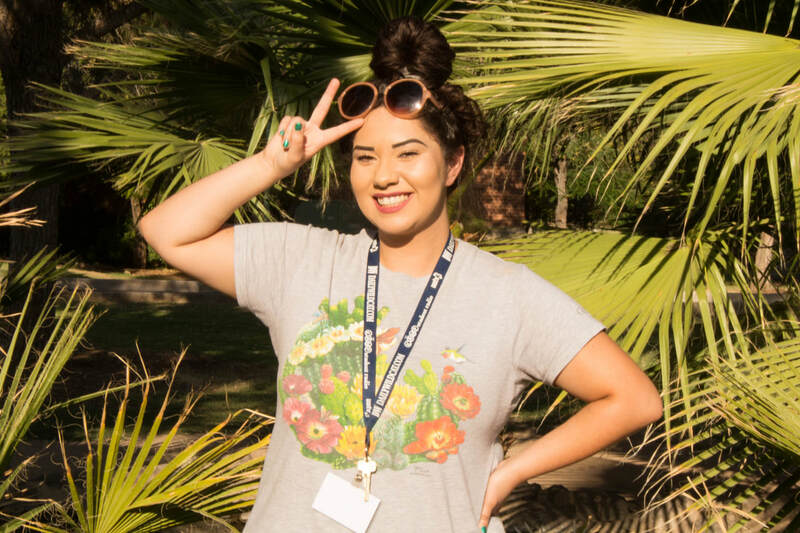 Dara experienced being a journalist at the University of Arizona Diversity Summer Program, where she got to be part of lectures given from mentors. Every lecturer was based in distinct areas in Journalism, such as Robin Tricoles, who is a science writer. Tricoles inspired Dara to pursue that career. “Robin helped me see myself being that,” said Dara. Dara will be attending a science camp in July and she said she is very excited to experience meeting new people. She looks forward to it since she has worked hard to collect the money and is ready to learn all the exciting new things they will teach her. 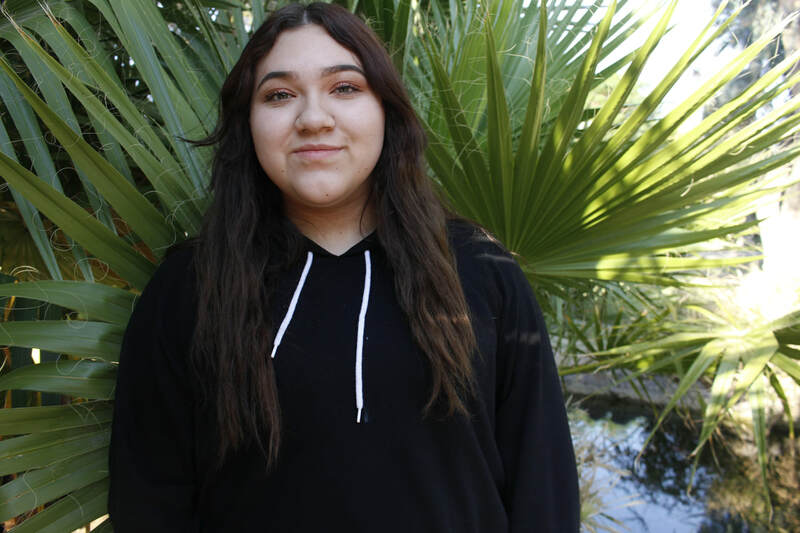 Grace Hardy, a 16-year-old Junior at Washington High School in Phoenix, wants to pursue an education and obtain a career in radio and photojournalism. Grace’s story starts on the island of Haiti, where an American woman named Juanita Hardy adopted her, raising Grace and another little girl. Her mother has inspired her to be independent. While in Haiti, Grace contracted congenital syphilis from her birth mother, but when Grace’s adoptive mother brought her to the United States she was treated and cured. Not one to retaliate against bullies, she turned the other cheek, never hitting back when people picked a fight. “I never fought back because I think physical confrontation is pointless, and fighting doesn’t solve anything,” she said. Grace involves herself in almost every club at school and enjoys volunteering with her friends. She helps her church, taking care of the younger kids by feeding and playing with them. She enjoys tennis and cheer but had to stop due to her health. Grace, one of only two freshmen on the varsity cheer team, adored cheer because she loves motivating people when they’re at their lowest. The day she made varsity was one of the best days of her life, she said, because she won Demi Lovato and Nick Jonas concert tickets in a raffle that same day. Grace felt distraught when she found out she couldn’t compete in sports at school anymore. She cried for days. Her migraines had gotten worse, so bad she couldn’t even go to school when she had an episode. Grace refrains from bright lights, waking up early in the morning and listening to music in the morning to ease the frequency of her migraines. Grace saw sports as a way to make friends. She felt that she was going to lose her friends once she quit, but she was wrong because those friendships remained. Grace, wants to focus her career on radio. She enjoys reporting because she loves talking to people and getting to know them by discussing their lives. Grace takes inspiration from the strong Black female lead character, Samantha White, in the show Dear White People. The character influenced Grace to pursue a career in radio because Samantha White has a radio show. Grace has ideas about impacting the world through teaching, specifically as a journalism teacher. She wants to leave a positive impact on her students because she believes teachers shape young peoples’ minds. “I feel like teachers often forget that students hold what they [the teachers] have to say at such a high level,” she said. Grace wants teachers to realize how much they pressure students without helping them with the workload, and as a teacher Grace would work with her students and help them grow as journalists. Grace always asks questions in class because she often struggles in classes where the teachers don’t cater to her auditory and visual-learner needs. As a teacher she would aid students who learn better in different ways compared to traditional teaching, she said. Grace cherishes her religion; she grew up Christian and goes to church at Christian Baptist North. The pastor’s sermons are relatable to Grace and give her insight on how to deal with difficult situations in her life, she said. Grace wants to end hate in society. She wants people to change the way they interact with others. She puts words to actions by working with her mom to pass out snacks to people in the streets, always remembering to smile. Nadira Mitchell’s first name was chosen from a book her parents looked through. They fell in love with its uniqueness. Nadira presents herself as an intelligent and independent young woman. She loves to go out rather than sitting and waiting for something to happen. Ever since a young child, Nadira loved the idea of journalism, especially telling the truth in stories that might influence people. When Nadira’s her mother caught on to her daughter’s passion, she helped her daughter sign up for several programs to strengthen her skills as a journalist. Nadira’s journalism teacher, Mr. (James) Bourland, urged her to do the University of Arizona Journalism Diversity Workshop to learn how to develop stories. 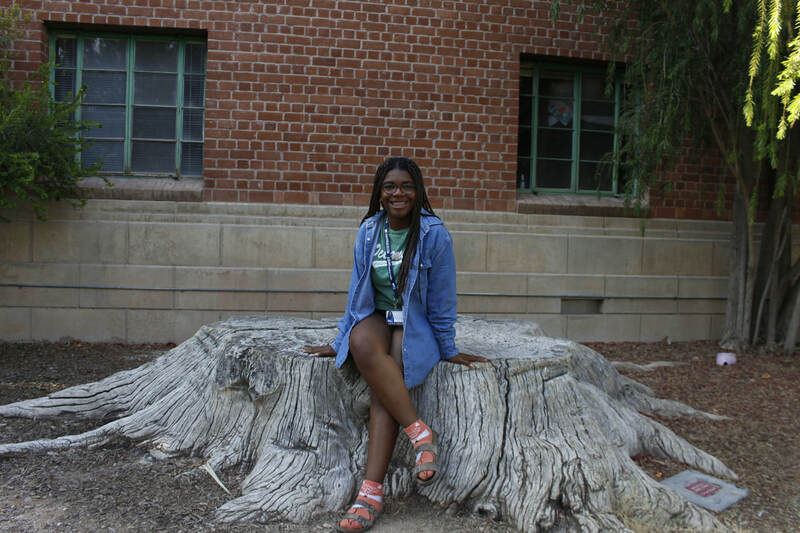 Nadira will be editor- in- chief for Tucson High’s Cactus Chronicle during the next school year. Nadira has been to Stanford University and Arizona State University to participate in their journalism programs, where she learned that doing journalism is more complex than people might think. Nadira participates in many school clubs, and she hopes to be more involved in movements that can potentially make a change. Nadira took part in honoring the 19th anniversary of the Columbine school shooting April 20, and her parents were fully on board. Even though Nadira has a busy schedule, she makes time serve her community such as participating in the MESA (Math, Engineering, Science, and Achievement). Nadira would love to travel back 100 years because she wants to know more about her roots. Her mother Navajo and her father is white. One career interest that makes her eyes twinkle is conservation biology, something that “preserves animals’ habitats in order to prevent extinction,” she explained. As a volunteer for the Arizona Sonora Desert Museum, she has learned to interpret and present information about animals. At the museum, she has developed communication skills interviewing and writing. She would love to work for the National Geographic Magazine an a report who reports about animals combining her loves for journalism and science. 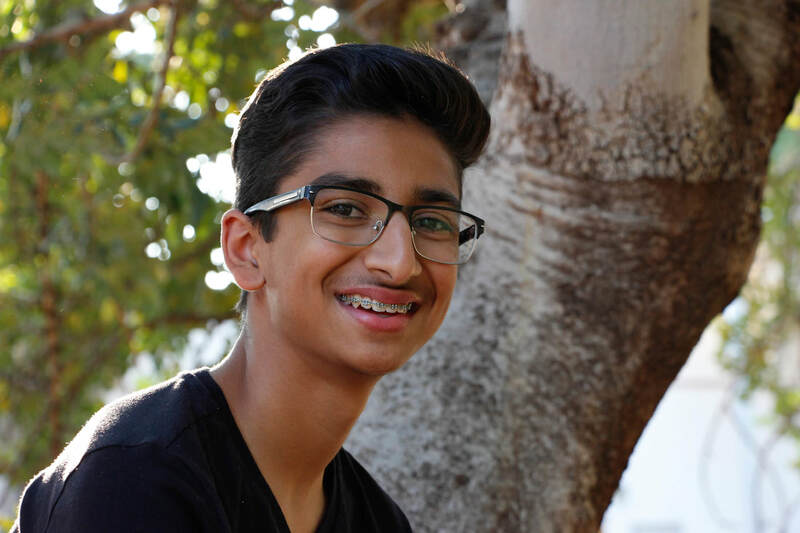 Rohan Patel, 15, was born in Northern California and moved to Phoenix, Arizona at age 4 because his father received a job with Pepsi then later became a safety consultant. His mother is an architect who has designed restaurants and other projects and now works reviewing architecture plans and ensuring that they follow zoning laws and legal requirements. Rohan attends Sandra Day O'Connor High School, in the Deer Valley Unified School District in the Phoenix area, where he will be a sophomore in the fall. For his school’s quarterly newspaper, “The Talon,” he will be sports editor, as well as a staff reporter. He also hopes to write about sports, such as basketball and football, as well as op-eds. Rohan is involved in his school’s chapter of the Future Business Leaders of America. The FBLA is a national club that has students from all over the country competing in front of judges, first at the regional level and then at a national level. Rohan’s team won first place in broadcast journalism at the regional conference in Tucson, Arizona, and will go to Baltimore in July to attend the national conference. His team had three months to prepare a news broadcast that addressed the track and field team and the FBLA club at school, as well as a main story about bike deaths in their community. Rohan plays the French horn for the Phoenix Youth Symphony. He began playing the French horn in fifth grade, five years ago. Though he plays classical music, Rohan prefers to listen to more modern music, such as rap and hip hop. One of Rohan’s favorite extracurricular activities is basketball, and he often spends his free time playing in his driveway or with his friends. Rohan also loves to read; his favorite genre being mystery due to his likes for the book “Murder on the Orient Express” by Agatha Christie. Like most high school students, Rohan is not sure what he wants to do professionally. He is considering a career in journalism and perhaps law, though he has no definitive career plans yet. When asked to describe himself in three words, Rohan said, “committed, stubborn and hardworking.” He believes in his opinions and himself and is passionate in everything he does. 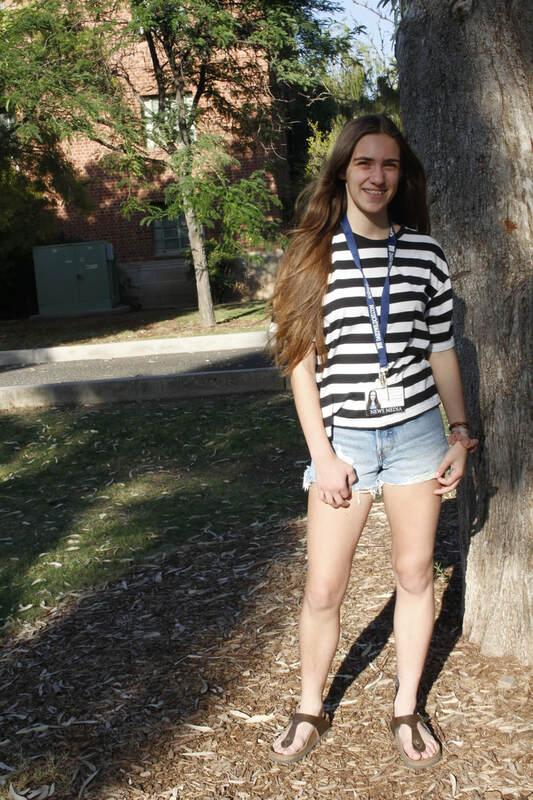 Madeline Richardson, a 15-year-old junior at The Gregory School in Tucson, Arizona, has varied interests, ranging from dancing to travelling, and she is committed to her passions. Dance is primary in her daily routine. She has been dancing for almost half of her life and dances to multiple genres of music. Madeline performs in multiple genres, with an emphasis on ballet. She puts much of her energy into ballet, yet she does not mind the struggles that come with learning the art. Madeline is attending a summer program for ballet arts. She is missing a week of the program to attend the Journalism Diversity Workshop. Madeline said that her mother, Jennifer Richardson, plays an important role in her life. Jennifer helped Madeline realize her passion for dance. Madeline also became involved with charity work, mainly because of her mother. She primarily volunteers with the National Charity League, which develops mother-daughter relationships and empowers women. She also volunteers at the Gospel Rescue Mission, which provides a safe haven for abused women and children who have been abused. “I think it’s important to give back to your community, and I really do enjoy all the work that I do,” Madeline said. Madeline also enjoys travelling, especially out of the country. She visited China when she was 9 years old as part of a student-exchange program. She also went to Japan and climbed Mt. Fuji. Madeline and her family travelled to Europe three years ago. “We went to Italy and we did a whole Italian tour for three weeks. It was really fun.” she said. 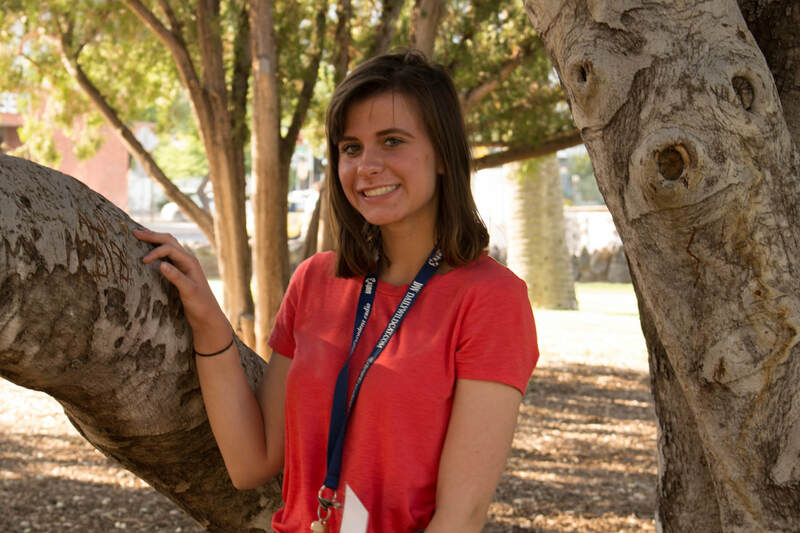 With college approaching, Madeline is looking into the University of Arizona Honors College. She said she feels that the UA will be a comfortable choice and will help her figure out her career choice. She is also interested in the University of St. Andrews in Scotland, which she was introduced to at a college fair, and a handful private colleges on the East Coast. Madeline was initially considering majoring in journalism, but she is now unsure of what career she wants to pursue. She is interested in psychological therapy to help others. Overall, Madeline is a positive, optimistic and determined person who wants to make a difference, especially in her hometown of Tucson. “I want to make the world a better place. I’ve lived in Tucson for most of my life… and my whole life people have been criticizing Tucson, which makes me sad because I really like Tucson,” she said. 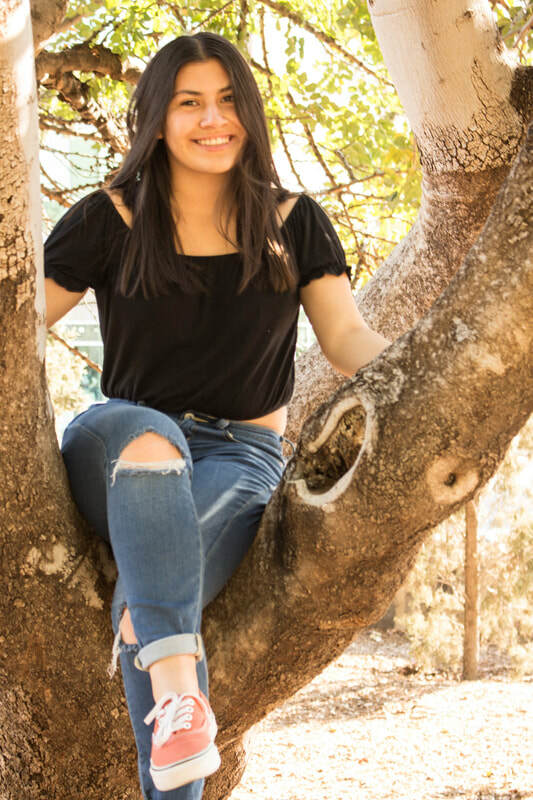 Stephany Rocha, 16, is a junior at Tucson High Magnet School who enjoys celebrating her Mexican heritage and tradition. Stephany has painted her face each year for two years in celebration of El Día de los Muertos, which occurs annually between late October and early November. El Día de los Muertos celebrates and honors members of one’s family who have passed away. Stephany is also passionate about her education. Beginning in the fall, she will be enrolled in Joint Technical Education District, taking her classes at the Tucson High Magnet School. Stephany is interested in JTED healthcare courses to prepare her for a career in the medical field. Stephany wants to become a medical assistant, licensed nurse’ assistant or physical therapist, because she wants to learn more about the human body. She would like to attend Stanford University or University of California at Los Angeles for graduate school. Stephany’s mother, Rosa Rocha, a cashier at Banner University Medical Center in Tucson, always told Stephany stories about her experiences and those of doctors. The stories about patients made Stephany think she might pursue a career in the medical field. Her father, Ivan Rocha, is a truck driver who spends most of his time in Texas. However, her father makes an effort to visit his family every two weeks for two days. Stephany has two older brothers, Ivan, 26, and Cristian, 24. Cristian is married with two children, Landon, 3, and Scarlett, 1. “My niece and nephew are my favorite people in the world,” she said. When Stephany is not spending time with her family, she spends time writing. She is involved with journalism and yearbook staff at school. Stephany heard about the UA Journalism Diversity Workshop from her Journalism/Yearbook teacher, Mr. James Bourland, who asked her to apply for the program. When she was accepted, Stephany decided to do the program to further her journalistic experience and improve her writing skills. “This program has been insightful about becoming a journalist instead of a medical doctor,” she said. Instructors and speakers in the program have encouraged her to combine her passion for journalism with her career goals in medicine. Jenny Sandoval, a 16-year-old Hispanic girl at Desert View High School in Tucson, has been passionate about photography for one year. She plans to continue with photography and attend medical school. Her interest in photography, is because she loves to capture the moment she said. Jenny will turn 17 on Aug. 21, and she has plans to see rapper J.Cole. This will be the second time Jenny has attended a J.Cole concert. “He is my favorite artist and I’m excited to see him a second time,” Jenny said. Born in Mexicali, Baja California, Jenny moved to Tucson when she was in the 7th grade. At Desert View High School, where there are 3,000 students, she is driven to achieve success. “My class has 503 students and I’m ranked number 30, but I am hoping this semester I can be in the top 10,” Jenny said. As a junior, Jenny took two Advanced Placement classes, which kept her busy. During senior year she will take three more AP classes as well as an honors class. “I get to work with people at a high level of education in AP classes and get to have a look into what a college course would look like,” Jenny said. Jenny describes herself as being very active in school. She is the soccer captain, editor-in-chief of the yearbook, president of NHS and president of the AP club. When Jenny isn’t at school, she enjoys volunteering at Quincie Douglas Library and helps a kindergarten teacher with grading papers and helping students with spelling at Southside Community School. “Helping grade the papers makes it easier for her to focus on helping the kids more. The kids find it fascinating when they have the opportunity to learn and play,” Jenny said. Jenny’s family is filled with soccer players and she remembers participating in games when she was little. Her soccer career started when she was a sophomore in high school and enjoyed playing as a left defender she was named team captain, last year in October. “It was challenging for me and the teammates to see myself as a leader but also see me as their teammate who they still have to work together with, despite not liking me as a captain,” Jenny said. Jenny is proud of all that she has done throughout her time in high school, staying active in sports, clubs and community service. When Jenny isn’t helping others or participating in extracurriculars, she does a lot of homework. When she has some free time, Jenny spends time with her four siblings, her brothers, Carlos and Cesar, and sisters, Ginna and Jeannely. Jenny had plans to move to California for high school and college, but her parents believed that Arizona was more convenient. Her mother works as a custodian at the University of Arizona’s campus, giving her the opportunity to obtain a tuition reduction, and her dad works at Civano Nursery, which fascinates Jenny because she gets to share her love for plants with him. Jenny plans to attend Stanford University to study medicine to become an anesthesiologist, but her biggest goal is to photograph baseball. She plans to attend the University of Arizona then transfer to Stanford, where she plans to continue her education. “I think San Francisco is a beautiful city, and I would like to live near there as well as attend college,” Jenny said.